Hi. I’m here to talk you off the ledge. Yesterday, my beloved Mets had one of the ugliest major league games I’ve ever had the misfortune of watching. Tim Redding actually did a great job in his first start of the season, but the real story was the Mets committing five errors, not to mention one horrible mental blunder by Ryan Church: coming home to score the go-ahead run in the 11th inning, Church did not touch third. 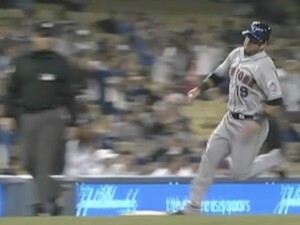 So after he crossed the plate, the Dodgers calmly took the ball, stepped on third, and that was the end of the inning. Church’s run did not count. The following turn at bat for the Dodgers was almost as brutal, as Angel Pagan in left didn’t get out of the way when Carlos Beltran called for a fly ball, causing it to drop. Despite this, the Mets actually had a chance to get out of a bases loaded, no outs jam, but replacement first baseman Jeremy Reed threw wide at home plate to end the game. To my fellow Mets fans, and sports fans in general when a bad game like this happens, I have one sage piece of advice: calm down. I know, this is easy to say in a vacuum and doesn’t bring much comfort, but let me introduce you to the concept of small sample sizes. Let’s say you’re playing poker: you’ve got pocket Aces, you raise, a guy behind you goes all in. You get giddy and call, and he turns over 75 suited. Now you’re even more giddy, he was on a straight bluff! Flop has a 7, so you’re a little more worried. Thankfully, nothing comes on the turn, but the river is a 5. You’re out. Now, you’ll probably stomp and curse and kick, which is entirely understandable. That guy just made a horrible play, and you got punished for it. But if you’re a high level poker player, this shouldn’t really affect you too much emotionally. In fact, the best players in the world will all generally roll with this sort of “bad beat”, and not even flinch. Part of this is just having the good emotional discipline that’s necessary to succeed in their line of work, but the logical aspect of this is rooted in an understanding of small sample sizes. 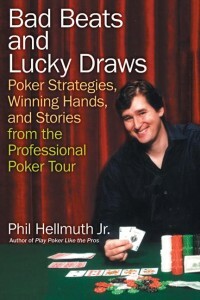 If you’re a professional poker player, you see hundreds of thousands, if not millions of hands a year. And within that massive amount of hands, what’s one bad beat? Entirely inevitable, not to mention fairly insignificant in the big picture. So why get hung up over it? For a better illustration, let’s say you took the opposite approach. If you didn’t recognize this one hand as a very small sample size, all kinds of poor, unhelpful things would result from it. You’d be steaming all week, complaining to anyone who would listen, and it would generally make you an angry, upset person. And then what happens the next time you’re in that seat, have pocket Aces, and someone re-raises you? Are you going to fold because last week your Aces got cracked? Of course not. Not to sound like the Dalai Lama here, but you need to have the emotional understanding that there’s no need to get upset about one isolated incident in the big picture. As a sports fan, I implore you to take a similar approach. When you focus on one play, one error or one loss and extrapolate larger meaning from that, it’ll bring you nothing but unwarranted emotional stress. Not to mention that on a logical level, it can cause you to come to some foolish conclusions. For example, on ESPN’s Sunday Night Baseball, Steve Phillips mentioned how Carlos Beltran didn’t slide home a few weeks ago on a key play, and used that to conclude that Beltran is a player who makes tons of mental mistakes. The internet went crazy the following day, as evidence piled on to show how wrong Phillips was. In turn, he’s probably lost a great deal of credibility with his audience moving forward. What I’m trying to say is, if a player on your team drops a pop-up, he’s not automatically the worst fielder on your team. If Johan Santana walks the pitcher, does he have the worst control of anyone you’ve seen? If David Wright strikes out with the bases loaded, is he suddenly not “clutch”? And this applies to positives as well as negatives. Just because Derek Jeter once dove headfirst into the stands for a ball does not automatically make him the best fielding shortstop of all time. If you hit nine home runs in the first thirteen games of the season, you’re not automatically the next Babe Ruth. Small sample sizes should not be used to draw long term conclusions. So just as many baseball players wisely note that you need to keep a level head through the highs and lows of a long season, we should try to do the same as fans. It’s honestly hard to come up with many scenarios more brutal than last night’s loss to the Dodgers, but at the end of the day, it’s one loss. One. And yes, we can extrapolate meaning in regards to say, the short term defensive configuration due to recent injuries and how it needs to be fixed, but beyond that, there’s no sense in feeling like the team is destined for failure because of one bad game. There’s a good chance the Mets will win tomorrow. If they don’t, I’m sure the media and some fans will think the sky is falling. If they win, and say, win a second game in a row the day after that, I’m sure many will do the opposite and feel they’re destined for the World Series. And both sides would be wrong. LoL @ 5 error Mets, worst team ever.